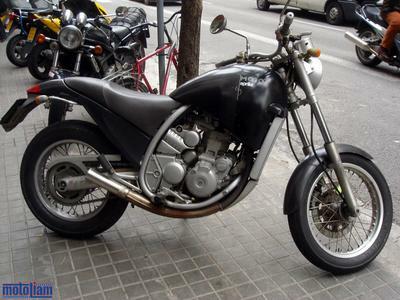 Sounds of Barcelona, and Bikes, too! 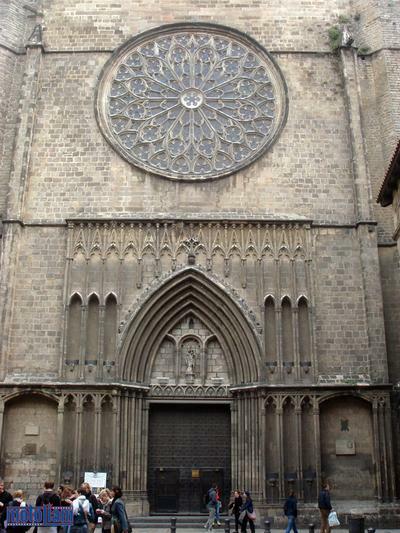 Walking through the older areas of the city, like the Gothica, Raval, or El Borne, you can see various cathedrals, roman columns, and ancient architecture from civilizations past. 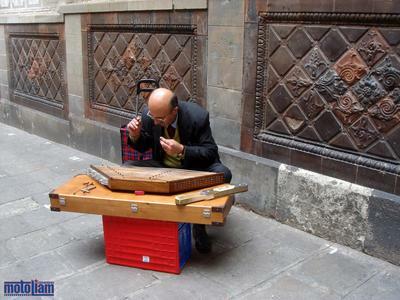 Invariably, there are street musicians playing their notes in the natural soundchambers the narrow alleyways create. As I walked towards my favorite pizzeria, I heard an instrument I wasn't familiar with . . . . It was a ten stringed instrument with a crossbar through the strings just off the center, and it was played using small, wooden sticks, sort of like a mix between xylophone sticks and drumsticks. Except the sticks were hooked to work with the index and middle fingers, and didn't have any form of padding on the tip. It was fascinating to watch him spool those things up and really get to playing, and he went on and on with different songs, rhythms, and flows. I nabbed a quick video, and if you can't see it, click on the direct link below. I'm not exactly sure how it all worked, but different tones and notes were achieved by striking the strings in different locations. There were no markers anywhere on the device, so it was purely by feel, experience, and ear, much like a standard "classical" stringed instrument. I thoroughly enjoyed watching him, and I passed along some coffee money afterwards. The weather has been hit or miss lately, virtually raining for the entire week that I've been back here. Ocassionally there are moments of dryness, a few hours to get out and stretch, and I've been noticing a lot more bikes on the sidewalks and streets as Spring is here. It sure doesn't feel like Spring - I've been bundling up quite a bit everyday. 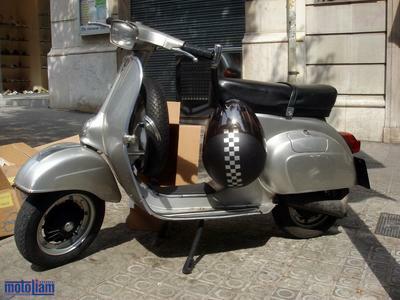 The longer I'm out here, the more convinced I am that at some point I will restore a vintage Vespa for light duty usage if I return to the States. I love the lines and the utility, and they're just plain cool. 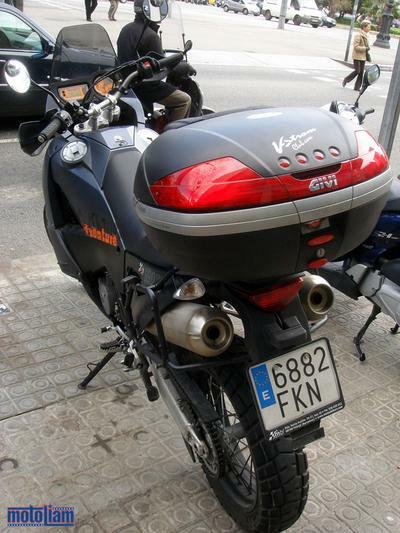 This scooter featured a rather unique gattling gun exhaust, and the license plate indicates that this is a full 50cc's of pure mayhem. Take that, Jesse James! 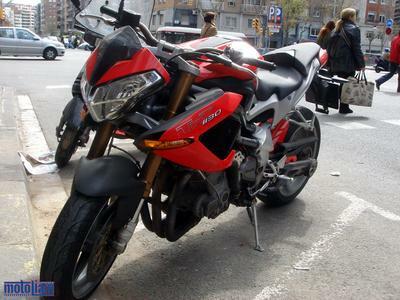 Another interesting bike I ran across was this matte black Aprilia 6.5, the Stark edition. I've always liked looking at the packaging of this bike, how everything fits and goes together. This big, beautiful KTM Adventure towered over other bikes in the area. Much as I like "trailies", if I was going to go for a V-Twin powered KTM, I'd be all over the SuperDuke. The only catch I see with owning a SuperDuke is the shape of the tank, and how that could be VERY dangerous in the event of a sudden stop. 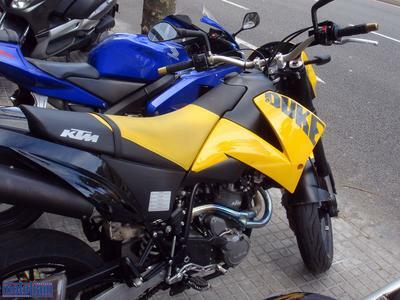 . .
A Yellow Duke?!? 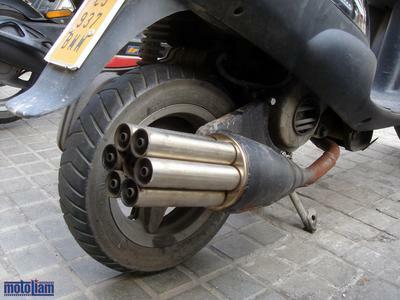 I couldn't get the image of a yellow Buell Blast out of my head after seeing this. Had a chance to get a close up look at the Benelli Tornado Tre . . . . and I came away disappointed. I think if you're going to spend a bundle of money on a unique bike, there shouldn't be bare wires hanging out - especially wires dealing with the charging system (which also featured an exposed section with the stator coils being "air-cooled"). Then again, I rode Buells for years, and if ever there was a case of "things just hanging out", that was it. At least, the early models. The new stuff seems fairly rock-solid and it's all packaged together really well. That's all for now, catch you guys later! 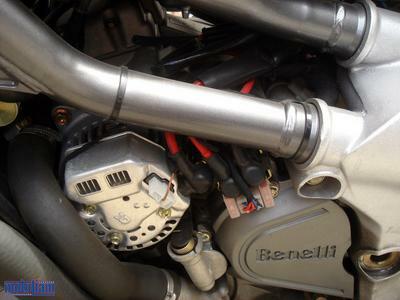 the Benelli looks like a case of "we had to change component vendors, now the cover won't fit". brutal. sweet man. that instrument is called a hammered dulcimer. you've probably heard it in recordings before but just don't realize it.